The continued array of private political fundraising and commemorative events being held at Washington’s Trump International Hotel has prompted fresh outrage from ethics critics, among them Walter Shaub, the former director of the Office of Government Ethics. In a series of tweets reviving the ongoing debate over whether President Trump is violating the Constitution by promoting his golf courses and profiting from bookings at the hotel, Shaub on Saturday decried the Embassy of Kuwait’s decision to celebrate its National Liberation Day at the hotel on Feb. 27 by hosting many Trump administration officials. Shaub, now with the nonprofit Citizens for Responsibility and Ethics in Washington, has also gone after the reelection campaigns of Reps. Mark Meadows, R-N.C., and Jim Jordan, R-Ohio, both high ranking on the House Oversight and Reform Committee. His tweet cited public records showing that the Jordan for Congress group spent $5,977 at the hotel, and the Meadows for Congress campaign spent $6,018, with larger amounts being recorded from the Republican National Committee, the Trump for President Campaign, the Trump Victory Fund and the America First Action Committee. “How many members of Congress, who have a constitutional duty to conduct meaningful oversight of the executive, giddily participate in events at the Trump International Hotel, a taxpayer owned landmark where Trump is his own landlord and the emoluments flow like the $35 martinis?” Shaub wrote. The criticism of Kuwait was prompted by a letter tweeted earlier by Rep. Ted Lieu, D-Calif. Kuwait's ambassador to Washington, Salem Abdullah Al-Jaber Al-Sabah, had invited Lieu to the February celebration of Kuwait’s 58th National Day and 28th Liberation Day. The Embassy of Kuwait did not respond to Government Executive inquiries by publication time. But it posted news coverage of the Feb. 27 event, noting, that its reception was attended by Commerce Secretary Wilbur Ross, Housing and Urban Development Secretary Ben Carson, Environmental Protection Agency Administrator Andrew Wheeler and Counselor to the President Kellyanne Conway. Inquiries to the Meadows and Jordan reelection campaigns were not answered by publication time. 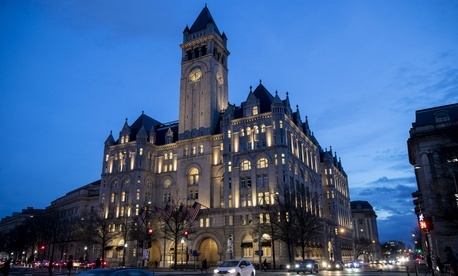 The White House, backed by the General Services Administration, has for two years maintained that the president’s continued lease of the federally owned Old Post Office Building that was renovated as the Trump hotel is not a violation of the Constitution. The controversy is under continued litigation and congressional scrutiny and has been reviewed by GSA’s inspector general. Meanwhile, on Monday the nonprofit American Oversight, a transparency group, released a statement accusing GSA, the Justice Department and the Office of Management and Budget of delaying the release of documents the group sought under the Freedom of Information Act. They are related to accusations that President Trump pressured the FBI to cancel its planned headquarters move out of downtown Washington to prevent a competing hotel from being built near the one Trump leases.